Following fellow cinema chain CGV, Lotte Cinema will stagger its ticket prices starting next Wednesday. 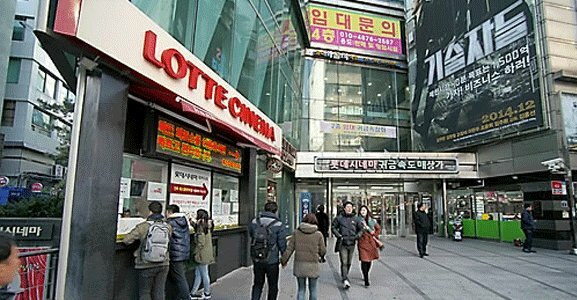 Lotte Cinema had previously run discounted rates throughout the week for movies shown before 10:30 a.m. while on weekends after the morning discount hours it charged an extra 1,000 won (90 cents) on top of the regular fee. Before, on weekday and weekend mornings before 10:30 a.m. the movies at Lotte Cinema were 6,000 won, weekdays after 10:30 a.m. they were 9,000 won and weekends after 10:30 a.m., 10,000 won. However, under the new rate system, the morning discount hour will be shortened to pre-10 a.m., regular hours limited to between 10 a.m. and 1 p.m., with the “prime hour” between 1 p.m. and 11 p.m. and “late night hour” post-11 p.m. newly introduced. On weekdays, the early morning discounted rate will stay unchanged at 6,000 won, while regular and late night hours will be discounted to 7,000 won. Movies at prime hours will sell for the previously “regular” fee of 9,000 won. On weekends the early morning movie tickets will sell for 7,000 won, prime hour tickets for 11,000 won and late night tickets for 9,000 won. Regardless of which time or day, the seats in the very front row will be discounted 1,000 won from their original prices. For the majority of moviegoers who watch movies mostly during the prime hours on weekends, Lotte Cinema’s prices have gone up 1,000 won. But those who can go to the cinemas on weekday mornings or at late nights on weekends will be able to enjoy a cheaper rate than before. Separately, another movie house CGV has since March 3 divided its seating areas into “economy” and “prime” sections, and began to charge an extra 1,000 won for the prime zone seats, which comprise 35 percent of the entire seating area.